As an afterthought to yesterday’s post I got out the kit pieces and tried various deck layout configurations for a second steam tug. I think that I will try this one, with a few nautical accessories. Kit components seeking inspirational use. But things keep getting better! 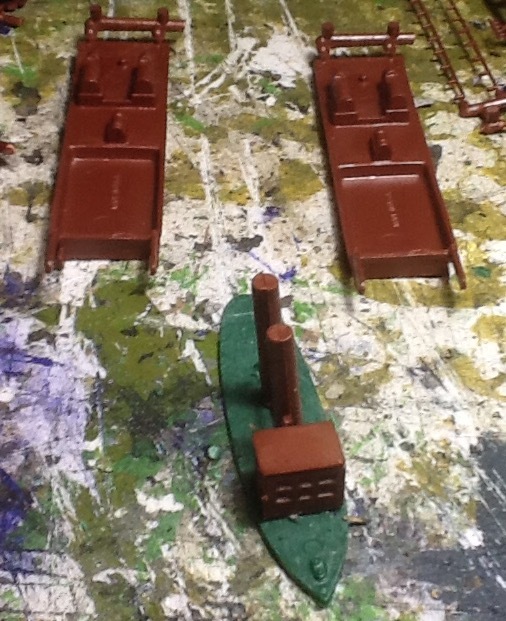 At the top of the picture are two river boat hulls, which just happen to be the correct dimensions for a German catamaran ferry or floating gun platform in 1:300 scale. It looks like my 19th century Americans will need to wait for a boat trip up the Mississippi. Previous Previous post: A little something to help the Germans along.